It’s no secret the definition of ‘freedom’ in America has changed a great deal in recent decades. While 9/11 was a major turning point, setting in motion a slew of changes to the American mindset and to the legal framework which governs the contract between the State and the people, our natural rights have been under assault for generations. Couple this with the dumbing down of the American citizenry, and ‘We the People’ simply no longer know or understand our rights. The fallout of this being we no longer protest or even notice when evermore egregious violations occur. Where has all the freedom gone? The following 10 secret truths about America are critical in understanding the state of the state today. 1.) The United States is one of only two countries in the world which taxes nonresident citizens for income earned elsewhere. If you reside in another country, as millions of U.S. citizens do, you’ll have to pay income taxes to two nations, or face prosecution by the IRS. This means that if you happen to have been born in the U.S. but lived your entire life elsewhere, you still owe Uncle Sam the full burden of income taxes, for your entire life. This rule is so insane that only two nations out of 196 nation states in the world do it. The other is the African nation of Eritrea. 2.) The Federal Reserve is not Federal and there is no reserve. The Federal Reserve Act of 1913 gave authority to a private organization to print currency. The result has been continually rising inflation and continually rising debt which is mathematically impossible to pay off. A group of secret shareholders in the Federal Reserve make a profit for every dollar printed and used by anyone. This is the most sophisticated form of financial slavery ever devised, and many future generations of people are already indebted to this cabal. 3.) There is actually no law requiring U.S. citizens to file income tax returns, and the income tax itself is unconstitutional. This complex and controversial issue is broken down in detail in the documentary America: Freedom to Fascism by the late Aaron Russo. 4.) The IRS follows Americans around the world and harasses foreign banks to control the finances of U.S. citizens. The Foreign Account Tax Compliance Act of 2010 makes it extremely difficult for Americans to function financially in other countries. Originally part of the Patriot Act, this type of global financial surveillance monitors bank accounts and deposits around the world. A result of this has been that many international banks will no longer do business with U.S. citizens, making it extremely difficult to live abroad. 5.) American churches are required to register with the federal government and are not allowed to engage in political speech. Historically, churches were the centers of communal and societal change, as pastors and leaders would speak to their congregations on matters of social injustice and government tyranny. The American Revolution would not have taken place if not for the churches, but in 1954 the federal government passed the ‘Law of Charities,’ requiring churches to files as 501(c)(3) organizations, which comes with heavy restrictions on freedom of speech. Churches today are sanitized profit centers of social complacency not social change. 6.) Free speech permits and free speech zones severely restrict our First Amendment rights. This policy began in 1988 during the Democratic National Convention as ‘designated protest zones,’ but grew in prominence during the G.W. Bush administration. Upheld and strengthened during the Obama years, this policy of severely restricting freedom of speech and of assembly has been extended to college campuses around the nation. We won’t see antiwar protests like what we saw during the Vietnam war because this behavior is now illegal. 7.) 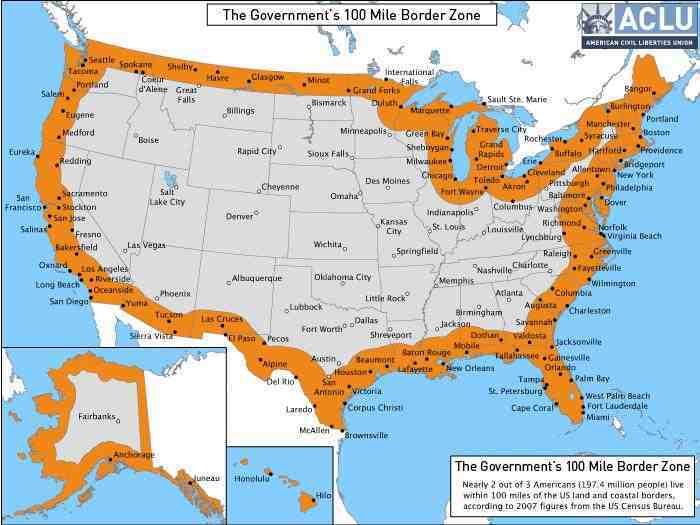 Approximately two-thirds of Americans live in official Constitution Free Zones, where U.S. Customs and Border Protection has been given jurisdiction over the travel right of Americans. Within 100 miles of the U.S. border anyone can subjected to the policies of border patrol, which is allowed to interdict, search and seize persons and property without the due process required for other areas of law enforcement. Couple this with the rise in sobriety checkpoints and other police state measures and you realize we’ve lost the right to freely travel. 8.) Many ordinary and historically common rights, behaviors, practices and occupations have now become privileges regulated and taxed by the State. Building a home, fishing, hunting, going off the grid, gardening, selling lemonade, mowing yards, driving a car, getting married, starting a business, cutting hair, and so, so much more are all activities that now require permission from the government. And for all of these activities, you’ll have to pay a fee for the privilege. Failure to do so can result in violent arrest, heavy fines, and prison time. 9.) Policing in the U.S. has become a for-profit branch of the government, and police brutality and violence is reaching epidemic levels. Law enforcement agencies around the U.S. have seized billions of dollars from law-abiding citizens in recent years. Traffic enforcement and local code enforcement works to generate revenue for local governments rather than for public safety. And the violence of police against Americans is everywhere. 10.) America has the highest rate of incarcerated people the world has ever seen. Prison in the United States has become big business, and thanks to the war on drugs, the government has found it acceptable to imprison millions of Americans, breaking up families, destroying lives and wasting taxpayer money. Although America has only 4.4 percent of the world’s population, it houses about 22 percent of the world’s prisoners. While America is truly filled with incredible, ingenious and productive people, we are living in a time when government has extended its reach into our lives in ever more serious ways, while going unchecked. In order to solve the problem, you have to see the problem; and as we look around, it’s easy to recognize that our freedom is being stolen from us. This article (10 Secrets About America that Will Make You Wonder Where All the Freedom Went) was originally created and published by Waking Times and is published here under a Creative Commons license with attribution to Isaac Davis and WakingTimes.com. It may be re-posted freely with proper attribution, author bio, and this copyright statement.